When problems are complex, solutions are imperfect. Actions taken in the face of complexity inevitably come to be associated with a hard to separate mixture of gains, losses, and ambiguities. These gains, losses, and ambiguities, furthermore, are understood and experienced from a variety of perspectives, none of which can justifiably claim to command a total view. Thus, not only are solutions to complex problems imperfect, there are no definitive criteria by which to interpret or evaluate the imperfection. As many have pointed out, dealing with complex problems calls for bringing together multiple disciplinary perspectives. As anyone who has participated in such endeavors knows, however, thinking together along with those trained in different disciplines – often with different ideas about what constitutes valid knowledge, not to mention different concerns and commitments regarding the relationship between knowledge and social change – can be frustrating. Like the problems they seek to provide insight into, furthermore, interdisciplinary endeavors are themselves fraught with power dynamics that are often impossible to disentangle from intellectual issues. Nevertheless, even as layers of complexity seem to proliferate, individuals and groups seeking to engage with the complexity of real problems need not yield to paralysis. 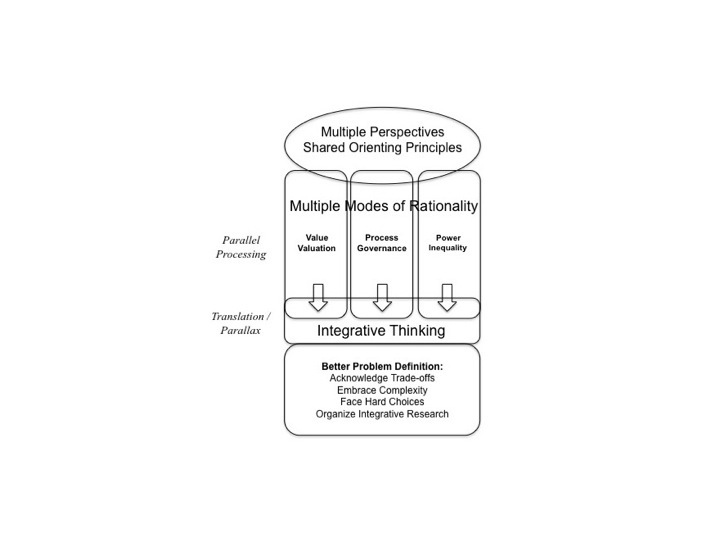 If one foregoes the urge to synthesize multiple partial perspectives into an integrated whole, but rather pursues the more modest goal of making space for multiple partial perspectives, and paying attention both to areas of overlap and areas of dissonance, then there can be a path – or, more accurately, paths – through the complexity and towards meaningful and adaptive actions. In developing the “Integrative Framework,” we’ve make the rather paradoxical attempt to engage systematically with complexity. Crucially, the goal is not to arrive at a single output – there will be no answer, and certainly the reality of imperfect solutions to complex problems will not disappear. Nevertheless, by allowing space for multiple perspectives and ways of thinking, gaining perspective on complex problems becomes possible. An expanded perspective, furthermore, can help diminish some of the unproductive tensions that often occur in interdisciplinary settings, and ultimately lead to actions (or non-actions) that avoid relying on an over-simplistic view. · A synthetic theory or model: The aim of the framework is not to produce a unified theory, or an analytical output that justifies one choice over another to all audiences. Indeed, an orienting principle of the framework is that all perspectives and models are partial, highlighting some problem dimensions while obscuring others. Any problem can be approached from multiple perspectives. When a problem is sufficiently complex, it becomes impossible to unify the views from multiple perspectives into an integrated whole. A commitment to exploring problems from multiple perspectives therefore begins with an acceptance and appreciation of dissonance and incommensurability. This dissonance can be more productively navigated with the identification of some shared principles. Based on experiences over the course of a four-year initiative that included practitioners and researchers across several countries and disciplines, we have identified a set of orienting principles that can serve as a starting point for a collaborative process of reflection and action. The three lenses emerged from struggles in communicating across the divides of discipline, organization, and culture. Each lens reflects a particular set of concepts and assumptions, and focuses thinking on a specific set of related questions. The concepts and questions are designed to be approachable from multiple perspectives. Answers to questions and subsequent discussion should be in “ordinary” – i.e. non-specialized language. The articulation of three sets of concepts and questions allows for two things: first, it allows for a parallel process in which different “modes of rationality” each have the opportunity to be expressed and experimented with in the search to understand and deal with trade-offs and complexity. Second, it allows for the development of new insights via the exercise of translation, which will undoubtedly yield both actionable successes and telling failures. 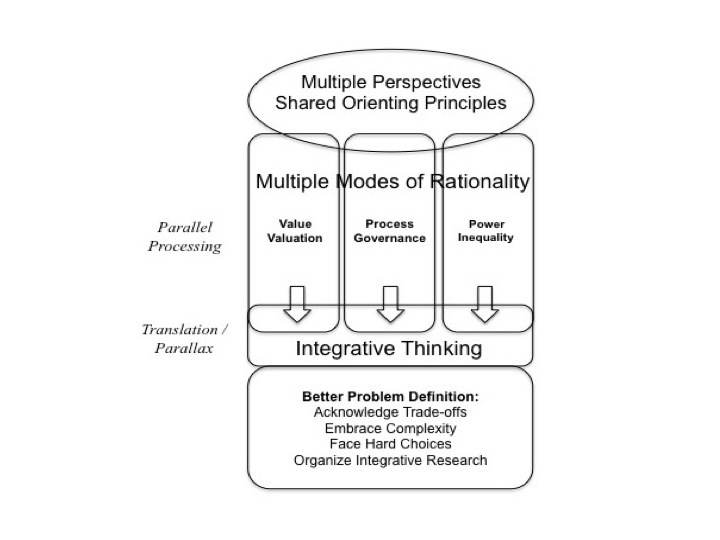 Making room for both parallel exploration of different ways of thinking AND for remaining open-minded in the face of the tensions that emerge can help to transform unproductive multi-perspective discussions into productive ones. Ideally, the result will be better problem definitions that open the way to generating and communicating better decisions, and formulating and organizing better research. Value and Valuation lens Assumption: good decisions come from good methods for counting and comparing different types of values. Focus: identifying values, identifying possible trade-offs between values, and exploring the issues associated with counting and comparing across different types of values. Questions: What is important? How can it be counted? What issues arise when comparing values across different conceptual and cultural contexts? Process and Governance lens Assumption: good decisions come from good public processes. Focus: the availability of processes for including affected parties in decision-making, and the role of governance in supporting / constraining them. Questions: What are the implicit and explicit forms of power that shape the articulation and negotiation of trade-offs? Consider the controversy surrounding the drive to proceed with hydraulic fracturing for natural gas development in upstate New York, USA. Land Trusts operating in the region are faced with the dilemma of deciding whether to A) develop easements in partnership with private landowners who also choose to lease sub-surface rights for natural gas exploration and drilling; or B) only develop easements with landowners who do not lease sub-surface rights. In such a situation, the constituency of a Land Trust may very likely be split between those who would rather guide the placement of drilling infrastructure so that it is more consistent with land protection, and those who would rather the Land Trust take the position that hydraulic fracturing is inherently inconsistent with the values of land preservation. Since the primary business of Land Trusts entails achieving land-based values by negotiating tax easements with private property holders in exchange for permanent protection, this dilemma would be highly salient for the actors involved, and its resolution one way or the other may have impacts at larger scales. The “Integrative Framework for Acknowledging Complexity and Embracing Trade-offs” grew out of Advancing Conservation in a Social Context (ACSC), an international program of research designed to investigate the complex trade-offs that exist between human well-being and biodiversity conservation goals. The John D. and Catherine T. MacArthur Foundation supported ACSC through a grant to Arizona State University’s Global Institute of Sustainability. Develop guidance for the selection of tools and methods for the evaluation of trade-offs. Co-sponsors for this work include the Center for International Forestry Research (CIFOR) and the Worldwide Fund for Nature (WWF). Thank you for sharing this. I plan to comment further when I have studied your article in detail. In the meantime please let me know if I can be of assistance. ¿Why do we engage in the solution of complex problems? I think we engage in the solution of complex problems because we foresee a greater good will come out of the solution. I mean ‘we’ the society (including academics), get involved in a conflict that could other wise be considered a two parts conflict, because from a more inclusive perspective we see a chance for a more beneficial outcome for more people (or a less harmful process). This is coherent with the idea that this complex problems might not end with a win-win situation for the directly involved and even explains why they might not like ‘any’ of the proposed solutions, because from their point of view they all are loss-loss situation (they will both give up some part of their original interest or maximum potential gain). ‘Solutions’ could be seen as a system of Trade-offs compensations and avoidance If we approached negotiation as a development project, then, the theory of impacts and risks assessment and management, would be called for. Society, government and the actors involved in negotiations would have to foresee the possibility and the responsibility of avoidance, prevention, mitigation, control and contingency of the impacts of their future actions over others and of the actions of other onto them. It is interesting that while trade-offs are pervasive in ecological theory, compensations are a cultural feature (only cultural animals compensate, mostly members of their own species/group). This is to say that, compensation would introduce a human/cultural element, that is, an element coherent and progressive with other human features that are being advanced in the framework for the solution of complex conflicts: dialog, differences recognition, values recognition, procedure and governance. This is to highlight the alternative to brute force approaches to complex situation solving, that would also exhibit Trade-offs and even their recognition (an example would be some of the recent policing of manifestations around the world). Impacts risks assessment and management theory is intrinsically coherent with the idea of complexity and in-commensurability because actions can have different impacts and can be managed with different measures and because we might have to compensate with different values because it is an acceptable (sometimes the only) alternative left (a bad but relevant example would be money compensations). The concept of compensations could be a complement to the process and to the framework, introducing the need to conceptualize, think and discuss them during the process, but also the need to include them in the implementation of solutions. As a trade-off, the idea of compensation would introduce or push, additional expectations for the process, with undesirable consequences, but we would have to acknowledge, such expectations already take place in those involved in complex conflicts, to point them out and provide an extended framework to deal with them seems an advancement. Finally, The responsibility of one actor for the losses of the other, or society for the losses of both actors, may enforce, over all solidarity (a value that I think is desirable in light of the proposed framework). The question of compensation and its relationship to trade-offs might very well be an opening for an exploration of the complexity of these types of issues that is both practical and critical.